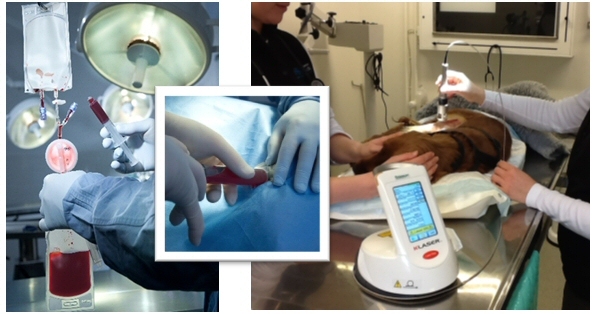 VBS Direct Ltd - Platelet Therapy Combined with Laser Therapy - Innovative solutions for the veterinary professional. Class IV laser therapy is a stand alone modality that has experienced an accelarated growth in veterinary medicine. With the current market availability of V-PET platelet rich plasma (PRP) injections gaining popularity, an obvious (and exciting) frontier to be explored is the combination of laser with these injections. Before diving in head first, however, let’s make sure these are compatible, even theoretically. The benefits of injecting a high concentration of autologous platelets come from their release of growth factors and cytokines that can stimulate healing of a variety of tissues. All of the “good stuff” in platelets are encapsulated in granules, and so if an external source can increase the probability of degranulation, this effect can be enhanced. This same mechanism holds for other naturally occurring granules such as those in mast cells. But here is the tricky part. There are some instances where you do not want mast cells to degranulate (think of an allergic reaction) and others where you do (think of an open wound). It turns out that lasers have been shown to increase the local number of mast cells, but under certain circumstances these mast cells have been initiated to degranulate quicker, while other times not**. While this may seem contradictory, it falls perfectly in line with some of the other secondary and tertiary effects of laser. Regulator proteins like bradykinin, prostaglandin, and even collagen do very different things when they are over or under expressed, and laser has been shown to promote BOTH over and under expression depending on the condition**. What? How? Laser is the enabler. The local environment dictates which direction these mediators turn, not laser. Laser simply provides more fuel (oxygen to the area) and ignites the engine (forces the oxygen to be processed into ATP more efficiently). So whichever way the body is inclined to heal itself, laser will provide the boost. It should be no surprise then, that the alpha granules inside platelets release their growth factors more readily when exposed to laser therapy. And while this seems very theoretical and abstract right now, with the number of practices utilizing these combinations (of laser with stem cell or PRP injections) ever increasing, the clinical data will start to fill in the gaps (the case history below is a good example). In any case, if your clinic is forward thinking enough to use either of these injection techniques, laser offers the next step (if it wasn’t already your First step). **For full references of the cited publications, as well as more examples of the forefront of modern laser research, visit the Library of Evidence at http://www.k-laserusa.com/results-research/k-laser-library/ or contact the author directly at bstephens@k-laserusa.com. Evaluation of low-level laser therapy, platelet-rich plasma, and their combination on the healing of Achilles tendon in rabbits. This new paper provides further evidence of the benefits of combining laser and platelet therapy. 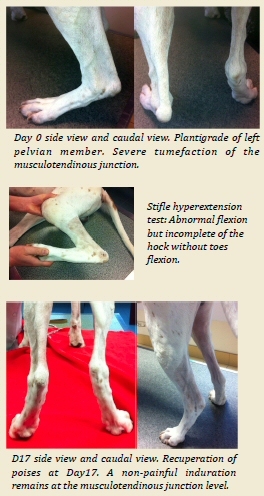 A 9 year old male Pointer, 25kg, with Achilles tendon musculotendinous junction rupture. The general clinical exam does not show any abnormality. The distal orthopedic exam shows severe limping of the left pelvian member associated with a severe plantigrade (pictures 1 &2). A closer exam reveals that there is oedema, swelling and lite hemorrhage in the calcaneal tendon region. The palpation pressure is painful and shows noticeable thickness of the musculotendinous junction without the tendon being sectioned. The articular test of the stifle hyperextension makes an abnormal flexion but incomplete of the hock without toes flexion (picture 3). The acute tendonitis leads to thickness and pain limited in the tendon region. The hock flexion is normal without plantigrade locomotion. The complete sectioning of Achilles tendon results in a complete hock flexion: the palpation reveals a tendon discontinuation. The partial rupture of the Achilles tendon with preservation of the superficial toes flexible tendon causes an abnormal flexion and incomplete of the hock with excessive flexion of the toes. The radiography confirms the absence of bones lesions associated; an ultrasound exam reveals the presence of hemorrhages and heterogeneous areas in relation with the fibres discontinuation. Because of the exaggerated flexion of the tarsocrural articulation, a surgical treatment of immobilisation by external fixation for tibiotarsien bypass is suggested. Because of the hesitation of the client, the following alternative is offered: We want to associate Laser sessions to Platelets Rich Plasma (PRP) injections in order to take care of the pain, swelling and tendon scars. The goal of the first laser session (K-CUBE 3, 8W) is to take care of the pain and reduce eodema. It is associated with a non-steroid (Meloxicam 0.2 mg/kg IV) anti-inflammatory injection followed by an oral administration (Meloxicam 0.1 mg/kg once per day PO) for 2 days. Strict rest and leash walking advises are given. D4: The local inflammation signs regressing significantly, injections of Platelets Rich Plasma are given under general anesthesia at the Achilles tendon level. D7, D11, D17 & D30: Four more Laser sessions are done to promote tendon scars. A progressive improvement is notice: at Day 17 the function recuperation is significant, complete at Day 30. The inflammation signs have almost disappeared; the only non-painful induration at the musculotendinous junction level being present (pictures 4 & 5). The dog is presenting normal locomotion without plantigrade and does not limp when walking, trotting or running with a leash. Strict exercise restriction orders are maintain for a month. Afterwards, the dog came back to the clinic on Day 60 and he does not show any functional after effects.